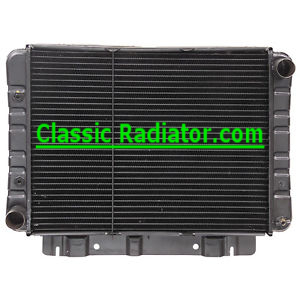 This radiator was designed to resemble the OEM crossflow style radiator as closely as possible. Core dimensions of this radiator are approximately 22 1/2" between the tanks and 17 1/2" tall. It is made to bolt in exactly as a factory replacement radiator would. Some late 1963 models may need a 1964 model radiator. Please confirm the mounting strap style that you need prior to ordering. An internal automatic transmission cooler is built into this radiator. It is available with-out the cooler for manual transmission applications. It is available in several core designs such as three rows of 1/2" inch tubes on 9/16" centers or 3/8" centers for a high efficiency core or a four row of 1/2" tubes on 9/16" centers. It can also be special ordered as a four row high efficiency. A three row high efficiency core will cool the same as a regular four row core without losing any existing fan clearance. Four row models will not have the core support rods due to the added core thickness. This particular radiator can be ordered in a variety of configurations to suit your cooling needs and your budget. It will fit the same as and function better than the original. Even the largest radiator cannot cool properly without good airflow. Consider replacing your stock 4 blade fan with a six or seven blade fan for optimum cooling. We stock radiator hoses and OEM style expansion tanks for the same application.